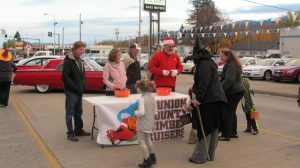 Our club really enjoys being involved with the La Grande Main Street Downtown’s annual Truck or Treat Halloween event. There were over 1,700 kids in wonderful, creative costumes who stopped by our table to Trick or Treat. This event is always a highlight of the year. before the onset of the crowds. Hosting of this web site is donated by Eastern Oregon Network, Inc. (EONI) in La Grande, OR. Thank you!